Parents in Cardiff who have been told there is no room for their children in Welsh medium primary schools are to be offered places at "starter classes". Cardiff Council will create the classes in existing English medium schools across the city. The parents of 540 children have so far applied for Welsh medium places in September, but only 505 are available. 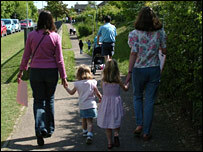 The council said it was confident that places would be available for all the children who have applied. But some parents and unions have said the council should build more Welsh schools to satisfy demand. There will be four starter classes of 30 places each in English medium schools in the St Mellons, Pentwyn, Fairwater and Grangetown areas of the city. The Welsh medium children will be taught separately. Mother-of-two Beverley Gil-Cervantes, from Canton, said she could not get a place at Ysgol Gymraeg Treganna for her younger daughter Elisia, despite her other daughter Meri attending the school. She said: "There are no places at Treganna. It's been over-subscribed for 10 years. There are 25 places and this year there were 48 applicants." Geraint Davies, Welsh secretary of teaching union NASUWT, said the shortage of Welsh medium places was "not acceptable". "On the one hand we should be celebrating the fact there is such a high demand for Welsh medium education in Cardiff. Unfortunately it is not a new problem," he added. "These starter classes must only be short-term answers." Mr Davies added that the only long-term solution was for Cardiff Council to build more Welsh medium schools. The council's chief officer for schools, Chris Jones said: "We've had an increased demand every year for the last ten years. "This particular year, however, demand was beyond our expectations. The consequence is that in four areas of the city we simply don't have enough room in the existing schools to accommodate the children." Plans to reorganise schools in Cardiff - which would have seen expanded Welsh medium provision in the city - were thrown out by councillors last year. Talks are underway which could lead to fresh reorganisation plans.